Figure 2.12 Average boundaries of sea ice (coverage at least five- to eight-tenths) in autumn and spring in the Antarctic. Arrows indicate the general drift pattern. The width of the stippled area indicates the range of ice limits between autumn and spring (Untersteiner, 1966). 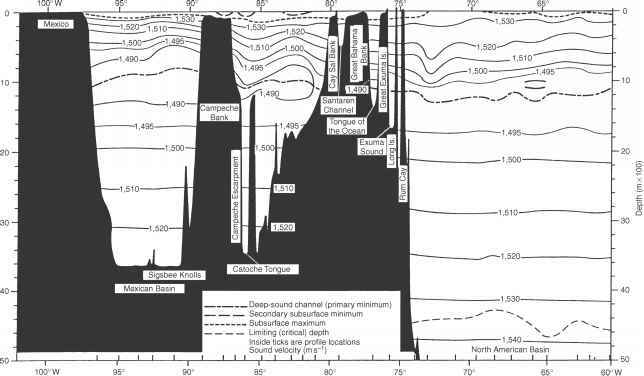 Because of the variable stratification of the bottom sediments in many areas, sound is often transmitted into the bottom where it is refracted or internally reflected. Thus, the bottom often becomes a complicated propagating medium that is characterized by both shear and compressional sound speeds. The topography of the sea floor exhibits a diversity of features not unlike those of the continental landmasses. 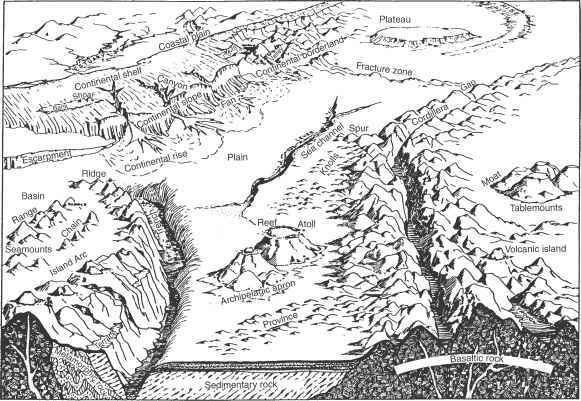 Figure 2.13 presents an artist's conception of common ocean basin features. The undersea features noted in Figure 2.13 are defined in the Glossary (Appendix B). Underwater ridges and seamounts can effectively block the propagation of sound, an occurrence that is referred to as bathymetric blockage. Moreover, when actively ensonified, seamounts can mask targets of interest by either providing false targets or by shadowing targets of interest. Figure 2.13 Common sea-floor features (Bowditch, 1977).